Variation is life, or life is variation. The arrival of your bus or train will vary from day to day, as will your car journey. The start and duration of the seasons varies from year to year. We have good and bad summers (mostly bad in the UK). Likewise, all business processes and their outputs are subject to variation. The number of calls a Contact Centre Agent will handle per day will vary naturally about some mean, as will the outcomes, e.g. sales achieved, problems resolved. Way back in 1925, Western Electric Company in Chicago USA, a Dr Walter A. Shewhart invented a new way to think about variation and how to use it to drive improvement. He identified two types of variation – variation from assignable (common) causes and variation from chance (special) causes. Common causes of variation stay the same day to day. 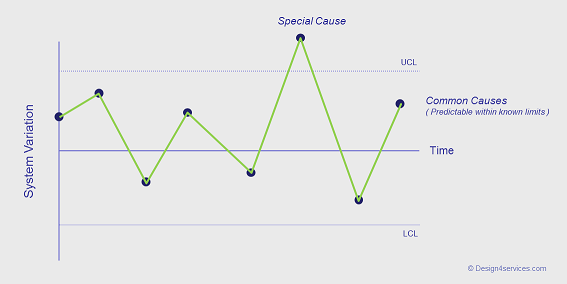 Whereas, special causes of variation result from factors outside normal events. A process is said to be in a ‘stable state’ and under ‘statistical control’ when the variation is predictable. In this state the process has a definable capability. Costs, performance, quality and quantity are predictable. If the process is not predictable, then it is in an unstable state. Shewart put his theory to practical application through the development and use of Control, or Capability Charts. These record the variation of a given process or product over time. He applied Control or Capability Limits, emcompassing the common causes of variation, with any data points falling outside these limits being deemed to be due to special causes of variation. A process can be improved by either reducing the degree of variation and/or by moving the mean value to the optimum point, determined by the point of greatest economic gain, called the Nominal Value (see “Loss Function“). Shewhart highlighted two mistakes that are made when attempting to improve results – to react to an outcome as if it came from a special cause, when actually it came from a common cause of variation; and to treat an outcome as if it came from a common cause of variation, when actually it came from a special cause. We will cover Capability Charts and their application in more detail under Methods. Their use and the application of Statistic Process Control (SPC) is probably one of the most important methods in our process improvement armoury. A very accessible introduction to the theory of variation and the use of related measures and data analysis. Go for a second-hand copy!